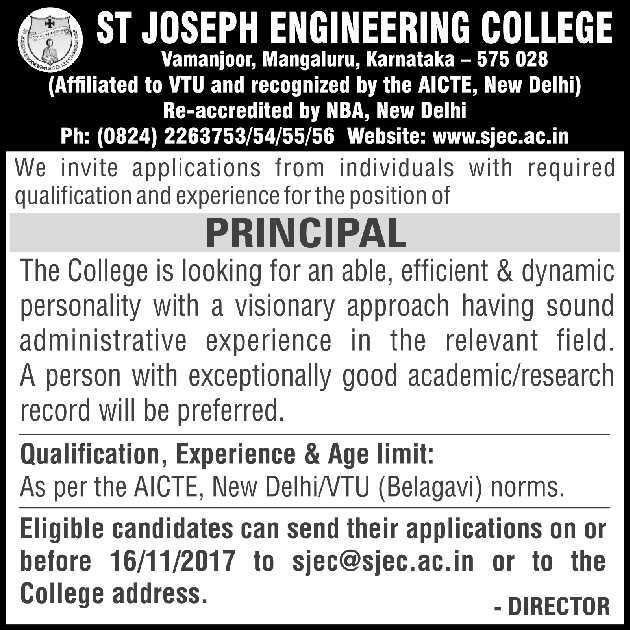 St.Joseph Engineering College, Mangalore has advertised in THE HINDU Opportunities newspaper for the recruitment of Principal job vacancy. Interested and eligible job aspirants are requested to apply on or before 16th November 2017. Check out further more details below. About College: SJEC is affiliated to Visvesvaraya Technological University, Belgaum, Karnataka State, and is recognized by the All India Council for Technical Education (AICTE), New Delhi. Established in 2002, the College offers top class education in Engineering, Business Administration and Computer Applications at UG, PG and Research levels. It has well qualified staff, state of the art laboratories and all facilities. Presently about 2300 students are studying in the College.